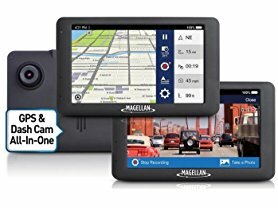 Today ONLY - Magellan RoadMate 6630T-LM 5" Full HD GPS Dashcam w/ 8GB SD Card for $67.99 (Retail $249.99). •5" Touch Screen Display: Large, vibrant, sunlight-readable display with day and night views for easy visibility and high resolution for video playback. •Free Lifetime Map Updates: Never worry about out-of-date maps again. Download the latest map information (up to 4 times a year) for the life of your Magellan RoadMate navigator. •Free Lifetime Traffic Alerts: Real-time traffic updates sent directly to your GPS unit to avoid traffic jams and other delays. Choose to continue your current route or take a suggested detour. Travel times are provided for all options. •Traffic Camera Alerts by PhantomALERT: Receive audible and visual warnings of fixed red light and speed cameras along your route free for one year. Become one of the many reporters on the roads by submitting your own discoveries or by rating the reliability of alerts. Premium content is available for an extra cost which includes black-spots (high accident areas), school zones, and dangerous intersections and much more. •Full HD 1080p Integrated Dash Camera: Forward facing dash camera continuously recording crystal clear video in 1920x1080 resolution. •Excellent Day &amp; Night Recording: Camera features 6 glass lens + 1 IR filter, aperture (f/1.8), and wide angle lens (110˚). •Impact Recording: 3-Axis G- Sensor measures forces and movements and lock current video, previous video clip, and next recording upon impact. •Lane Departure Warning: Visual and audible warning notifies the driver if they are wandering out of their lane. •Forward Collision Warning: Visual and audible warning alerts drivers if they are getting too close to the car directly ahead. •Location, Date and Time Data: All video recordings display GPS location, date and time information. •Landmark Guidance: Receive directions using 10 POI categories of landmarks as your guide, making it a more intuitive way to navigate. •Junction View: Realistic images of freeway signs and arrows guide you to the correct lane to make driving easier, safer and less stressful. •Speed Limit Warning: Manage your speed along your route with optional settings for visual and audible alerts. •Best Parking: Provides parking garage locations, hours of operation and directions to the entrance. 8GB microSD Card Included: Compatible up to 64GB Class 10 microSD cards. •Driving Break Reminder: Receive an audible alert that it is time to switch drivers, or if driving alone, take a break and relax. Driver's select the amount of time they can drive before being reminded. •Headlight Reminder: At sunset drivers are notified to turn on their headlights for better visibility and safer driving. •Digital Camera Mode: Detach device from its mount and it can be used to take hi resolution images. •Video Playback Mode: Use the large hi-resolution screen to immediately watch any recorded video. •Manual Save and Protect: Save any recordings with simple touch of a button. Let's you save any unexpected moment that is not impact related. •Multi-Destination Routing: Plan a trip with multiple stops in the order you want, or let your Magellan navigator select the most efficient route. •OneTouch™ Favorites Menu: Find your favorite restaurant, bank, gas station and more in any city with a single touch. Easily create shortcuts to your favorite destinations and previous searches with personalized bookmarks so you can quickly find them anywhere you travel. •QuickSpell® with SmartCity Search: As you type the first few letters of your target address •QuickSpell instantly narrows the search based on your destination. •7 Million Points of Interest (POI): Search and route to millions of preloaded destinations such as gas stations, restaurants, hotels, attractions and other points of interest. •Highway Exit POIs: Search and route to millions of preloaded destinations near upcoming highway exits. •Preloaded Premium Maps: Travel the United States, Puerto Rico, and Canada with all the maps you need, pre-loaded on your device. •Automatic re-route: Missed the turn? It happens to the best of us. Quickly get back on track with auto re-route. •Customizable Route Method: Select shortest distance, fastest time, most use of freeways, or least use of freeways. •Spoken Street Names: Hear street names and directions for a clear understanding of when to make the next turn while you keep your eyes on the road. •Address Book: Create and store personal points of interest and skip repeated address entry. Shipping is free with Amazon Prime or $5 Flat for non members.